Thomas Guillozet, adviser for the Greater Versailles Area Foundation Fund, presents Jennifer Bruns, executive director for Big Brothers Big Sisters of Shelby & Darke County, with a check to be utilized for their Big Buddies after-school mentoring program at Versailles Exempted Village School District. 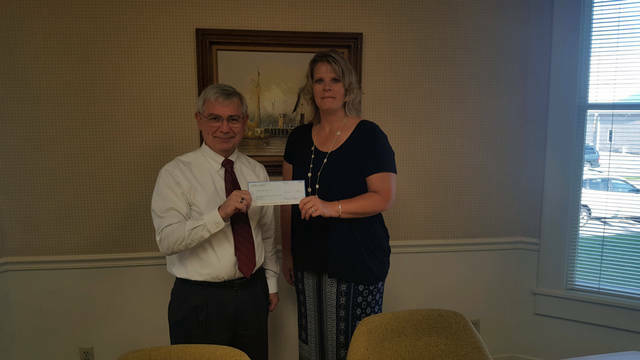 VERSAILLES – The Greater Versailles Area Foundation Fund, in conjunction with The Troy Foundation, recently awarded a grant to Big Brothers Big Sisters of Shelby & Darke County. Last year, Big Brothers Big Sisters served 210 students younger than the age of 18 in its after-school Big Buddies programs throughout Shelby and Darke counties. High school mentoring programs have become a widespread component of many nationally affiliated Big Brothers Big Sisters agencies. Studies prove that children who spend time with a positive role model are more likely to become healthy, productive adults. This donation will allow Big Brothers Big Sisters of Shelby and Darke County to expand and continue its Big Buddies program in Versailles. The agency is currently recruiting high school students to participate as Big Buddy mentors for the elementary school Little Buddy mentees who are enrolled in the Big Buddies programs. Big Buddies programs are held at Ansonia Local Schools, Greenville City Schools, Sidney City Schools and Versailles Exempted Village Schools. For more information, students can contact their school guidance counselor or call the Big Brothers Big Sisters agency office. Big Brothers Big Sisters is a non-profit United Way member agency. Anyone who would like to make a difference in the life of a child, either through volunteering or financial contribution, should contact the agency at 937-492-7611, 937-547-9622 or go to www.bigbrobigsis-shelbydarke.org for more information.